Note: This post contains affiliate links for which I may earn a small commission to support the Catholic Newbie blog if you make purchases through these links. Thank you! So you spent the last nine months of your life going to weekly sessions to learn all about the Catholic faith, attending weekly mass and receiving special blessings. You got through the nerve-wracking first reconciliation and you made it through the long Easter Vigil finally confirmed in the faith and an official member of the Catholic church. Congratulations! Joining the Catholic church is not an easy process, nor should it be. We only want you to join the Body of Christ if you’re truly passionate about Jesus Christ and “thirsty” for best way to life out your faith. Many of us Catholic “newbies” (as I like to call us :)) are zealous for all things Catholicism, especially at first. We’re so excited at this jewel we have discovered in the Church that we want to learn all we can and tell everyone who will listen to us all about it. But like new love, sometimes that excitement wears off. I’ve got 13 things you can do to keep your faith on fire and make sure that come next Easter you haven’t fizzled out. First, you need to start your Catholic life with prayer. I started the tradition of a yearly silent retreat before I joined the church and I’ve found it so beneficial to help me discern next steps in life. Check your diocese or one nearby for retreat houses or monasteries that offer a day’s silent retreat. You can often choose to spend at least one night if you’d like, as well, and it’s always a very minimal cost less than $40. Turn off all electronics and just check in periodically for emergencies and try to be as silent as possible. Pray the rosary, visit the chapel (if one is available) in silent meditation, walk the grounds, pray the Stations of the Cross if available, read the Bible, read spiritual books and record your thoughts in a journal. LISTEN to God and you’ll be amazed at the direction you receive in silence and prayer. I always feel myself slipping away when I get busy and end up sacrificing my prayer time. I’d suggest praying as close to the start of your day as you can (for parents it may be after the kids go to school or before they wake up). Consider praying the Liturgy of the Hours (you’ll find them in the free Laudate app available on smartphones), pray the rosary, offer your day’s work to the Lord that it may work for His will, and pray any prayers that are special to you (perhaps to your confirmation saint or Mary or other prayers you love). I also try to remember to stop at noon and pray the Angelus (a short prayer to Mary that the Pope prays daily), as well as offer a closing prayer as I go to sleep. You might start by adding the rosary once a week on a set day and see how it works in your life. Once I started praying it weekly, I quickly wanted to pray it daily. However, I mostly pray my rosary decade by decade throughout the day however I can. I may pray the opening as I take the dog for a walk, pray two more decades at noon, pray another two in the shower at the end of the day and finish as I go to sleep. My advice, though, is to get started early otherwise the day will get away from you and you’ll be too tired to pray the whole thing. Read my tips on How to Work the Rosary Into Your Busy Day. The simplest way to do this is to sign up for a free email that either provides you with a daily verse to read or tells you which verse to read. The founders of Flocknote offer free emails that take you through the entire Gospel in a Year, as well as the Catechism in a Year. You can also read the Catholic Church’s Daily Bible Reading on your free Laudate app, by subscribing on USCCB.org or in a daily missal book. There are also Bible reading plans like the free 90-day Bible Reading Challenge from Ascension Press or the Coming Home Network’s Bible Reading Plan and Catechism Reading Plan, which takes you through related parts of the Old & New Testaments. Or pick a book of the Bible that you feel called to and start reading a chapter a day! This is one of my favorite ways of growing my Catholic faith. I have stacks of books and online lists of books that are just GInormous! Try to read at a minimum at least one Catholic book a year. Need suggestions? 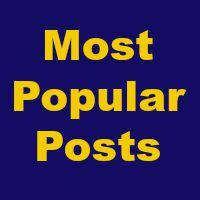 Check out My Favorite Catholic books Pinterest board, check out my Amazon book list on the right side of the page or email me if there are specific things you want to learn more about. My two absolute favorites are “New Testament Basics for Catholics” by John Bergsma (see my review) and Matthew Kelly’s “Rediscover Catholicism.” No need to spend tons of money on this either — see what you can find at your library and ask them to transfer things in if they don’t have it. This is where I started! That’s pretty darn clear to me! While you’re at mass, consider using a mass journal. This is a recommendation from Matthew Kelly, author (who I mentioned above) and founder of DynamicCatholic.com. Pray at the beginning of mass that you will learn something to help you grow spiritually and when you realize what it is, write it down. It’s something you can review from time to time so you don’t forget what God is trying to teach you. Request a FREE one from DynamicCatholic.com (you just pay shipping). OK, I’m upping the ante here :). If you really want to grow in your faith, try to get to daily mass at least some of the time. I find this is how I learned a lot about the Catholic faith (and still do) in the homilies and the daily Scripture readings. It’s a free activity that only requires the sacrifice of your time (usually only about a half-hour) and the best part of it all – you can receive Jesus any day of the week!! I find it a wonderfully quiet and centering way to start the day. It helps set the tone of my day and reminds me what’s most important as I go through my daily tasks. Another of my favorite activities (that I still tend to let fall off when I get busy, but shouldn’t!) is quiet time spent in front of the Blessed Sacrament or the exposed Eucharist in Adoration. For newbies, this means that you can sit and pray, read or meditate on Jesus by sitting in His actual Presence (meaning his REAL presence in the form of the Eucharist). You can actually SIT with Jesus!! You’ll find much direction and discernment here. Ask most priests, deacons, nuns, monks, etc. about their discernment process and they will tell you spending time in adoration played a role. This doesn’t mean God will tell you to be a nun (He might though :)), but you’ll a get much clearer idea and sense of peace about the plans He has for you. Most churches have a Blessed Sacrament (not exposed) or Perpetual Adoration (exposed) chapel where you can go sit with Jesus anytime. Don’t let Him be lonely! You please Him greatly by spending time with Him. If you want to learn more about your faith outside of books, consider taking a class. I’ve considered getting my master’s in theology (for lay people) and looked into institutes around me who offer flexible programs. St. Meinrad in Indiana and Franciscan University of Steubenville (Ohio) both offer flexible programs with online components, though I’ve determined right now isn’t the time for me, but I hope to begin the process down the road. If you just want to learn and don’t want to pursue a degree, consider reputable online programs like the Avila Institute, which offers classes on various saints, spiritual formation, spiritualities and more that you can do from home. I think you will also find the fire fizzling if you don’t regularly go to the Sacrament of Reconciliation. While it’s an easy one to put off, when you get there and confess your sins, you feel remarkably better and receive grace to continue to battle your temptations. Here is what I wish all RCIA candidates knew about confession. I’d recommend going at least monthly if you can. It will keep you in good spiritual health. Plus, as Vinny Flynn points out in his book, “7 Secrets of Confession,” this is one of a few Sacraments where you experience the Real Presence of Jesus, this time not in the Eucharist but in the priest who acts as Jesus in hearing and forgiving your sins. Don’t miss that opportunity to be in the presence of Jesus! It’s a tremendous blessing! I won’t go into this in depth here since this post is already long, but it’s a great next step in deepening your faith. Read more in this past blog or check out the books “True Devotion to Mary” by St. Louis de Montfort or “33 Days to Morning Glory” by Fr. Michael Gaitley. Did I give you too many marching orders!? Take it one step at a time starting with prayer to determine where to begin. It’s also a lot about building habits. In the book “The ONE Thing: The Surprisingly Simple Truth Behind Extraordinary Results” by Gary Keller (one of my all-time favorites, though not specifically Catholic), he says it takes about 66 days for a new task to start to feel like a habit, so add in one thing at a time till it becomes a habit and see how it flames the fire in you. If you liked this post, would you mind giving Catholic Newbie a “like” on Facebook below? Thank you! do you have any copies of the mass journals? i just saw this and i’d love one! I do! Just email me your mailing address to [email protected] and I’ll be happy to send you one. I believe I’ve given out all my mass journals. Would you be interested in a copy of The 4 Signs of a Dynamic Catholic by Matthew Kelly? If so, email me at [email protected]. Thanks so much for commenting and sharing and welcome to the Church!! Thanks for this article, I have been wondering where to go next since my entrance into the Catholic faith at Easter, especially as my priest was sent to another parish five days after Easter. I have felt left a little in limbo, but this piece has reaffirmed my approach of reading to learn as much about the faith and saints, and of course most importantly attending mass and praying. That must have been tough to have your priest leave right after you joined! I find it jarring for sure when one of our priests leaves. It seems you just start to get to know them and then they’re moved. We just had a priest transferred after only 5 months here :-(. 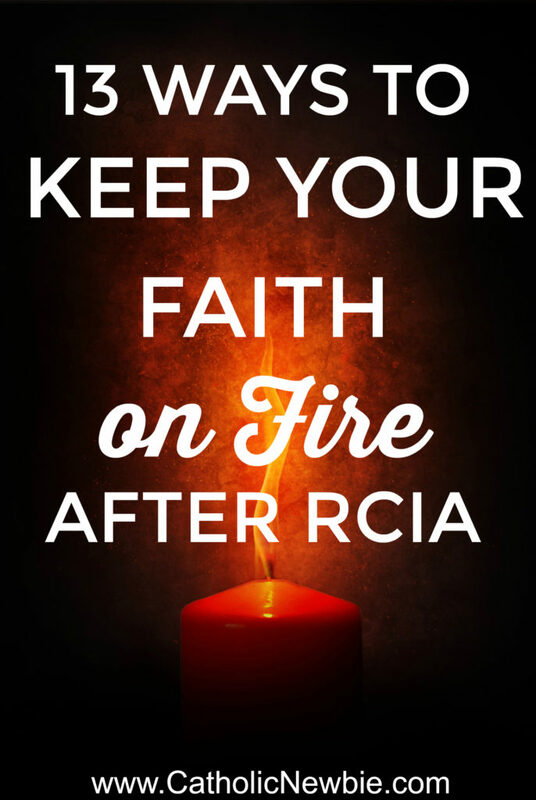 I think there does need to be more support for RCIA candidates after joining the church to keep them active and involved. I hope this post is a start! Thanks for commenting! This is a great list for any Catholic to enrich his or her faith! 2, 6, 9, 10, and 12 alone should be the bare minimum. Me too! Thanks so much for your comment! I stumbled across this post on Pinterest last night, and it was EXACTLY what I needed at exactly the moment I needed it. I joined the Catholic church just this year, and recently haven’t been doing anything really beyond attending weekly Mass. I need and want to make more of an effort to connect to my new faith, and learn more. My favorite part of this post, that I want to begin to incorporate to balance myself out, was the daily reflection advice. I’ve been focusing on the “what could I have done better” question a LOT the last couple weeks, and while that’s good because I need to make changes towards being a better and more Godly person, it’s been taking a toll on my psyche. I need to get everything in perspective with a balanced look at my daily self. Thank you! And I look forward to using my entire morning at work to reading book summaries and adding to my “must read” list! Yea!! That is wonderful. I’m so glad you came across it and welcome to the Church! Here is Matthew Kelly’s Daily Examen from “The Four Signs of a Dynamic Catholic”: http://dynamiccatholic.com/four-signs-of-a-dynamic-catholic/prayer-process/ And here are my favorite Catholic books on a Pinterest board if that’s helpful: http://www.pinterest.com/acatholicnewbie/my-favorite-catholic-books/. Let me know if I can answer any questions for you! Thanks for commenting. This is great!! Exactly what I needed right now. This is exactly where I’m at right now, so active in my catholic faith. I’m sorry I didn’t see this earlier, the mass journal would’ve been helpful. Yea! Pass it along to others 🙂 and you can still get the mass journal! Hello, I am an adult Catholic convert 23 years in. All your points are great, prayer life and sacramental life are extremely important. I’d love to see you add to “getting involved in your Parish” to include getting into a Bible or catechetical study group, a prayer group or some sort of Catholic support circle. Finding a good little community to share your faith journey with is very important. Great work, God bless you. Hi Mina, thanks for your comment! You are absolutely right. In fact, I just went through Christ Renews His Parish at my church and I’ve found that the best experience yet for helping me to find my own little community, as you said, and to help me truly feel a part of my parish. Highly recommend CRHP if you have it at your parish! Would it be alright to reprint your article with your credits ? Great advice. I’m not a Newbie. I do practice almost all of your suggestions. They have helped me grow in my faith in knowledge and strength. I will try the Mass Journal. Thank you. I will be following your blog.